A lifetime ago, I would have taken pity on me. Perhaps with dash of smug self-satisfaction. I would have congratulated myself on my dedication and single-mindedness and ‘felt sorry’ for the present me’s lack of focus. You see, 8 years ago I was halfway into my jiu jitsu journey. 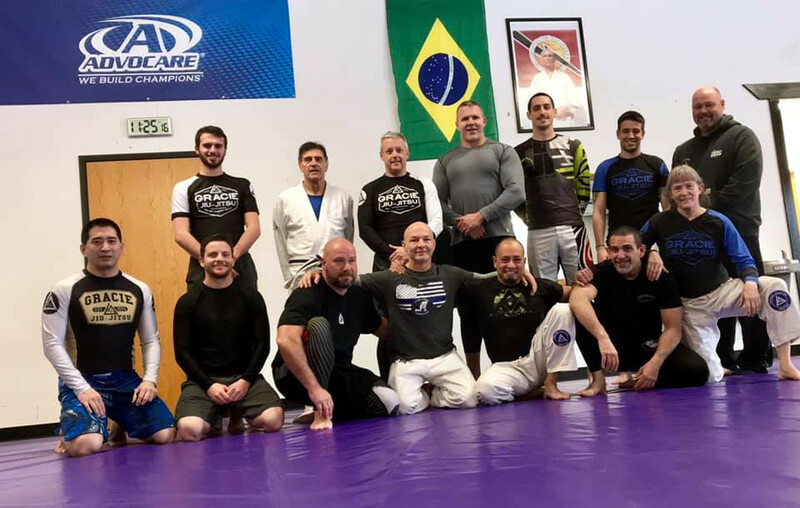 I’d had disruptions due to knee injuries, but overall trained several hours a day, 5-6 days a week, both at my club – Dartford BJJ – or with partners on my home mats. However, since those more innocent times I’ve become a parent, battled depression, nuked my adult life and relocated overseas, moved house again into our ‘forever(-ish) home’ and started a second business. Much of that in the last 3 years. So, yeah, my focus is more dispersed now. I no longer daydream about jiu jitsu A LOT. I don’t spend those hours visualizing and writing in my training journal anymore. Nor do I get to hit multiple classes a night. My pace is slower but steady. Two mornings a week at Gracie Jiu-Jitsu Victor, 2-3 sessions of strength & conditioning at Wolf Brigade Gym and perhaps an extra drilling session with a pal. A 30-something me would have inwardly scoffed while trying to understand how any priorities might override mat-time. A 40-something me is pretty cool with it and a little gentler on me and a little more fully understanding of others. Good for me. What’s my point? My point is that it is okay to be a part-timer. Let me give some context. ‘Growing-up’ in jiu-jitsu I often heard ‘part-timer’ thrown around with derision. Perhaps you too have observed people chiding those who couldn’t be around as much as they used to be – for whatever reasons – with ‘Hello, part-timer’. Likewise, there’s the more subtle micro-aggression of ‘Haven’t seen you for a while’. While these certainly can be friendly banter with people you’ve honestly missed training with – and I believe, in the main, this is what I have observed or received – there is an accusatory undertone. A bit of criticism about one’s commitment. An amplification and expectation of guilt and shame for not being at every regular session. I mean, aren’t we all supposed to be rock stars that have a neurotic meltdown if we have to miss a few sessions of training?! No. This is unsustainable. I refuse to accept that the ‘jiu-jitsu lifestyle‘ has to be all or nothing. If this were the case, I would have jacked it in when my son was an infant and I was lucky to get 1 session a week. Life can and will get in the way sometimes. If the only way we can train is proverbial balls to the proverbial wall, our community will whittle away its diversity, reducing itself to a subset of people who can and want to subordinate everything else to jiu-jitsu. So, while I am really thankful for the reps I got in while I was in that position, and I am happy for anyone who chooses that path now, I am in a place where I can honestly embrace being a ‘part-timer’. If you are finding it hard to reconcile yourself to part-timing, I hope you can get to that place too. Here’s why: we don’t want to lose you. BJJ is stronger with you in, even if you can’t / don’t compete or move up the ranks very quickly. The more different kinds of people we have on the mats, the better off we all are. From the pros and high-level amateurs getting ready for comps on the regular, to working parents who carve out their 2 regular sessions a week (holla!). From robust 20-something bodies, to well-kept 50-something bodies that need a bit more recovery time. All the hearts and minds bring something special to the mat’s melting pot. So what are some ways to embrace life as a part-timer? Losing your purpose or not having one in the first place can be discombobulating. It’s also ok for your purpose to change. Just make sure you are always coming back to the mats for yourself. Whatever the reasons that are making training less of a ‘no-brainer’ a clear understanding of why you do what you do, what you get from it, and why it is an important part of your life will keep you going. And this is one of the many reasons why it can be important to embrace your part-timer status. If you train for the pat on the back of being on the mats all the time, or to smash the competition, or to get that blue belt, you are on an unsustainable path. These might be subsets of your purpose for being there. However, what they all have in common is external expressions of self. They are about achievement rather than personal development, joy or the process of learning. In other words, the more your purpose for training is shaped by a growth mindset, rather than by the external validation that can come from achievement, the more long-term and sustainable your reasons for training. Likewise, when you need to adapt your training to life’s little (or big) bumps and knocks, resilient reasons for training, rather than more brittle achievement-based reasons will hold you down. That is not to say that embracing life as a part-timer is a license to under-achieve, to sell yourself short or not give a hoot about developing your mastery. On the contrary, it is a call to action to be on-point when you are there. Indeed, John Danaher testifies to the abilities of the part-time grappler who trains with focus. If you can only give yourself 2 sessions a week, so be it. However, when you are there, make the most of it. Get your reps, work on goals and enjoy yourself! My final piece of unsolicited advice to those suffering from part-timer guilt, is to focus on how BJJ makes your life better. How the art / sport / discipline improves you. Again viewing this through a lens of personal growth and satisfaction, rather than achievement, per se. We’re talking more ‘flow’ and the psychology of optimal experience, less ‘being the best’. When these kinds of concerns are your focus, it is easier to transition into a part-timer state. It may still grate. It may still be raw to fall behind your cohort in terms of belt rank, or moves-owned, or competitions fought. However, it will also give you the psychology to cope with keeping BJJ as part of your life, rather than life itself, as and when you might need to. Because, guess what, it is okay to love spending time with your family, or building your business, or learning to play drums, or pay the bills. Or whatever else you want or need to prioritise. From this vantage, a part-timer isn’t a shameful shirker. On the contrary, the part-timer courageously keeps coming back to the mats even when it is hard and the path is less clear. BJJ isn’t for the faint of heart. It is one of the more challenging ways to spend your free time. This is, of course, why we love it! However, one area that can feel particularly frustrating is sparring. Full disclosure: I am only a purple belt; I have very limited competition experience; and since becoming a parent my training is more like 2 times a week rather than 6. That said, I have 20 years of martial arts experience, including 14 years on the mats. So, I have picked up a few things both through my personal struggles and working with folks at different stages of their journies. With this in mind, I hope these BJJ sparring tips can help you to develop your sparring game. When mulling over my BJJ sparring tips, I realised they fell into two main categories: physical and conceptual. On the one hand, are more physical or practical considerations. On the other hand, are more conceptual or mind-set considerations that can underpin your physical practice. Let’s start with the physical. The starting point for improving your sparring is drilling. Only through consistent repetition of your techniques will you develop the tool-set and muscle memory to improve your sparring. That said, there’s drilling and there’s drilling. You want to do the latter. Attentive: keep your mind on the task at hand. While there is value to exploring the potential vulnerabilities of a technique, when drilling use your time to drill the scenario provided by your instructor. Know that there’s always a response to and/or vulnerabilities to a given technique. However, your job right now is to drill the technique and ‘bad guy’ indicators provided by your instructor. As you progress, you’ll learn more techniques and nuances. So, do yourself a favour and stay on task rather than chatting about the whys and wherefores – you’ll get there in time! Relentless: don’t stop until your instructor calls time. If you’ve got a question, get an instructor’s attention. Camaraderie is a big part of our practice, no doubt, and we needn’t be dour. However, it is more important to get those reps than have a chat/give yourself a breather. Be dogged in your pursuit of drilling excellence. In short, number 1 on my list of BJJ sparring tips is: approach your drilling with mindful precision. Discipline and precision in this area of your practice will pay off when the ‘water gets deep’ in sparring. This list of BJJ sparring tips assumes that ‘free-rolling’ is the kind of ‘sparring’ you are looking to improve. Many readers will be aware of multiple sparring types such as positional sparring, flow-rolling and free-rolling. Each of these tools suits a different job and, ultimately, training a variety of sparring methods will improve your free-rolling. So, positional sparring is sparring from a set starting-point often to a set end-point. For example, one person in full guard with the goal to pass; the other person seeking to sweep or submit. When either player meets their goal, the positions are re-set. This form of sparring can help you to apply techniques that you don’t yet ‘own’ under a bit more pressure than in straight drilling, but without the full chaos of a live roll. Clearly, the beauty with which you applied your technique in drills will degrade in this and all other sparring scenarios. That’s exactly why you worked so precisely in drills! Now that your implementation is getting a bit messier in sparring, it is still pretty tight. If my BJJ sparring tips includes positional sparring, it is only logical to highlight the value of flow-rolling. Flow-rolling is another kind of ‘transitional sparring’ that sits somewhere between drilling and free-rolling. However, it is more free-form than positional sparring, as there’s no set start or end points. This style of sparring is generally at a slower and more relaxed pace than free-rolling and partners are encouraged to: 1) ‘catch and release’ rather than to apply submissions; 2) keep moving by not holding positions for more than a few beats. While flow-rolling can feel really awkward at first, with consistent practice it can help you to develop your timing and your application of techniques that are not yet fully integrated into your game. To re-cap, some ‘physical BJJ sparring tips’ include precise drilling and including variety in your sparring forms in order to improve your free-rolling. However, there’s more to sparring than the right grip or accurate positioning of the hips, it is as much in the mind as in the body. Sparring with a mission can help you to consolidate and evolve your game. Know what you’re working on and stick at it until you’ve got it working. A gauge I use to determine if I can do a new thing is if I get it consistently on lower belts of all sizes and proportionally less successfully as the skill gap closes. For example, when I was focusing on basic scissor sweeps from the guard as a blue belt, I felt it was ‘mine’ when I could get the sweep on white belts of all sizes on the regular and occasionally with people of my own experience level. By the time I had some ownership of this sweep, my team mates started to have answers to my sweep. In response, I then focussed on a kimora attempt if the sweep failed and they based out with a hand or transitioning to a variation to remove a supporting leg if they based out with a knee. This is the arms race. Through this escalation, you and your clubmates strengthen and expand your skill-sets. By setting and pursuing clearly defined goals, you can gradually build your toolkit, timing and judgement. Goal-oriented sparring practice is a great way to develop your skill-set and make consistent – if sometimes agonisingly slow – progress. So, how do you choose your goal? Simple, start at the beginning. You learn lots of cool drills in class. Sometimes these techniques are further along the journey than where you may be. Don’t get me wrong, it is great to be exposed to these techniques and you should try them in positional sparring, flow-rolling and free-rolling. However, when defining your sparring goals, start basic and progress from there. In other words, if you don’t yet ‘own’ a decent elbow escape from mount, putting energy into spider-guard sweeps is putting the cart before the horse. Therefore, map your goals logically and trace a route from more basic and high percentage defensive and offensive techniques towards more advanced variations. This approach can help you to create a solid foundation of fundamentals while giving you the skills and timing to move towards more ‘advanced’ variations as and when you’re ready. Again, to be clear, yes – don’t be afraid to try stuff! Nevertheless, when identifying your goals, start with the basics and build from there. Moreover, when defining your sparring goals, think ‘defence first’. This has multiple advantages. Firstly, from a self-defence perspective, focussing on keeping yourself safe has merit. Likewise, from an injury-prevention point-of-view, working from a defence-first mindset can pay great dividends. Secondly, from an improving-your-sparring vantage point, confidence in your defence can help you to move towards opening up to mount your attacks. In other words, once you’re an excellent nail, you can find yourself getting a share of the hammer-time. Similarly, an excellent understanding of defence, augments your offensive powers. That is, fully understanding how one defends a position, can help you to better develop attacks-by-combination and the subtlety that great offence requires. Big guy on top? Stay calm, work that defence. From a defence-first practice naturally flows patience and resilience to goading. You know what is really easy for this lightweight 42-year-old woman? Dealing with strength. ‘Cuz guess what, I already know that you are stronger than me; if you take a break from proving that to yourself, you’ll have a much better chance of getting the better of me. Want to know why? I fight fire with water. I have zero interest in playing the strength game. While I take care of my body including strength and conditioning for BJJ, I lost the absolute strength battle when I got on the mat. Pretty much all of you are bigger and younger than I am. That’s cool, I’m patient and more annoying. Through defence-first training and a focus on ‘not losing’ rather than ‘winning’, I’m able to ride out a storm and pick my timing. Attacks telegraphed with brute force are relatively easy – if exhausting and repetitive – to deal with. And I’m obnoxiously persistent. However, smooth, sneaky, elegant traps blind-side me and are much more likely to get me ruffled. So, the moral of the story is, stay cool. Work your goals, built on a broad foundation of basics, with an eye towards defence and you’ll find comfort where there is none. In that place, you can chill, find your opening and ply your offence. It might not be today, or tomorrow and it may well be 5 years down the track, but that’s kinda what you signed up for when you walked onto those mats. That in itself took guts, so the ability to remain composed in chaos and weather the storm is in there. Find it. Harness it. Nurture it. No set of BJJ sparring tips is complete without mentioning the importance of tapping. If you’ve spent any time on the mats you’ve doubtless heard common tapping tropes: ‘if you’re not tapping, you’re not learning’, ‘leave your ego at the door’ and so on. Cliche as they might be, these adages are worth keeping close to heart and mind. A willingness to tap is vital to your BJJ sparring. Why? First of all, safety. Yours and your partner’s. The tap is sacrosanct, and with good reason. What we do is really quite dangerous! Respecting the tap is essential to keeping everyone in one piece and fully functional. Moreover, this cuts both ways. If your partner has you, tap! It isn’t fair to them if you allow ego to take control and put them in a spot where they injure you. Likewise, if you feel or hear a tap – STOP! Not sure if that was your partner or not? Stop anyhow and reset if you erred on the side of caution. You already know this, however it bears repeating. Next, learning. If you are the smartest person in the room, you need to find a new room. If you are uncomfortable with not being the smartest person in the room, address that right now. Vulnerability to learning is the only way you are going to get better at BJJ sparring. That includes tapping early and often. Feel like you could power out of a sub? Go for it. Congratulations, you just learnt nothing. Forgo the saccharine pleasure of ‘escaping’ through speed/power/force. Pull your big-kid pants on and tap. Well done, you and your body now know where there’s a hole in your boat. See steps 1-4 above, and repeat. Now, you’re really getting somewhere. Finally, as a bonus, resist the urge to tell someone ‘that wasn’t a real submission’ after you just tapped to it. I get it, perhaps it wasn’t very well applied, or it was some sort of strengthy bend-you-into-a-pretzel move. That’s on them. Your job is to work with your instructor to develop great responses to their attacks, even if they don’t seem to be proper. Help them address their offensive technique with superior defensive technique. Keep the snarky ego-driven sour-grapes for the ‘inside voice’. 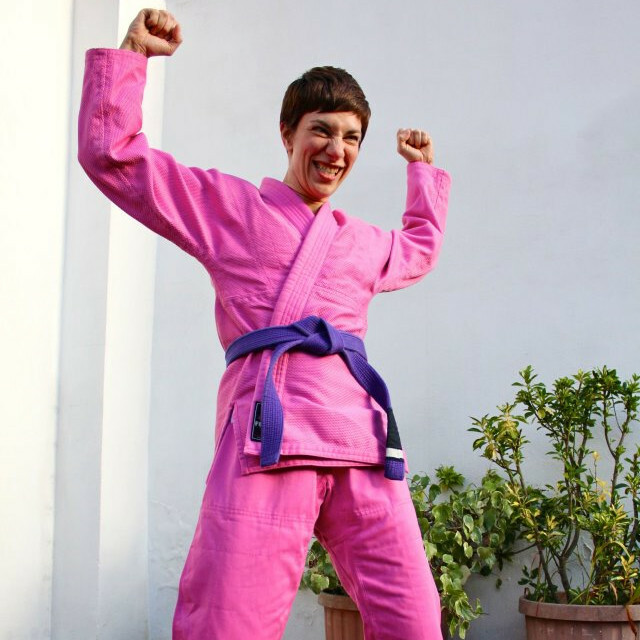 Of course, no purple belt’s humble BJJ sparring tips can prepare you for the gruelling self-examination that walks hand-in-hand with levelling up in jiu jitsu. All I can promise is that this formula has been at the heart of my practice and improvement from day 1. My understanding and application of these concepts has advanced and, I can only hope, will continue to do so. Perhaps, there’s helpful BJJ sparring tips here for you too. Because this beautiful thing we do, man, it is tough. If any wisdom is to be found here, it has been repurposed from my instructors past and present, including, but not limited to Dave Birkett, Marc Walder, John Ingallina and Greg Walsh as well as great practitioners whose seminars have pushed me along, notably, Royce Gracie, Ryron Gracie and Frank Cucci. jiu jitsu lifestyle (joo-jit-soo lahyf-stahyl): the habits, attitudes, tastes, moral standards, economic level, and etc that together constitute the mode of living of those engaged in Brazilian jiu jitsu, a martial art and combat sport that teaches a smaller person how to defend herself against a larger adversary by using leverage and proper technique. ‘The habits, attitudes, tastes, moral standards & etc’. In other words, the fundamental components and expressions of one’s worldview. When jiu jitsu is your lifestyle, no matter what else comes your way, quitting is not an option. Injuries, big moves across cities, states or oceans, babies, elderly family, work pressures, money pressures, time pressures all conspire to cut our time with jiu jitsu short. Living the jiu jitsu lifestyle isn’t just about acai bowls and being mad on kimono. Those things are part of it, but just the tip of this ‘berg. At some stage, not sure when, like with a sweep, there’s a point of no return and your relationship with jiu jitsu is no longer negotiable; it takes on a life and momentum of its own – think that’s called ‘love’. Love is easy at the start. It is all hormones and handsy and sweaty and fun. With the miles come the struggles and the pressure tests and the challenges. In love as in jiu jitsu, endurance offers great rewards. In love as in jiu jitsu, some drop out and some commit for the long haul, for better or worse. I know now that I am in this thing, come what may. 5 years ago jiu jitsu was easy. It wasn’t really, but after 7 years my confidence in my defence let me work my offence. I was putting myself in triangles and all sorts of bad spots with good level, bigger people and escaping, reversing and submitting. After intense toil and self-scrutiny I could finally sniff the experience that seemed so common and ‘easy’ for the men in my club. Then, KABOOM! ACL surgery; pregnancy; birth and caring for an infant (plus a sprinkle of postpartum depression for good measure); trans-Atlantic move; re-entry shock; refurbishing a new house; new jobs; and homesickness. For the record, my worst days are better than most of the worlds’ bad days – I get that – nonetheless, my life got mangled. Jiu jitsu stayed with me, and I with jiu jitsu. My pregnancy was active and included drills and some sparring. Infancy was the toughest to balance, and while infrequent, privates with my UK coach, Dave Birkett from Dartford Academia de Jiu Jitsu, kept me in the game. Within 12 months of the baby, Friday night training was more and more regular. 2 and a half years on, we moved to the States where I scrambled to find the right club for me. Serendipty! Gracie Jiu Jitsu Victor had just opened its doors. Likewise, up the street was Wolf Brigade, a strength and conditioning gym, that has empowered me to take my body back after a rocky recovery from ACL reconstruction / pregnancy / birth / infancy-sans-self-care. In all the chaos of becoming parents and moving overseas, jiu jitsu – and what Greg Walsh at Wolf Brigade calls ‘physical culture’ – kept me steady and on course. Sometimes, one has to step back to truly move forward. Readers may be aware that I chose to wear a white belt when I started at Gracie Victor. With all the disruption to my training, my body, and my fitness, this was the right place for me to start in a new town and with a new club. This decision was all about me. It was about what I needed to rebuild. It was about my need to feel worthy of my belt. It wasn’t asked or expected of me. Gracie Academy respects the belts of students that come from outside. I needed to take a step back and methodically re-work my core jiu jitsu. The Academy offers a clear path for someone in my position: belt verification. ‘Verification’ is the process whereby the Gracie Academy verifies that one’s skillset and mindset harmonises with the priorities of Gracie Jiu Jitsu. Pre-requisites for a verification are passing the Gracie Combatives and Blue Belt Stripe 1 tests. This is a lot of material. Dozens of techniques and their ‘slices’ along the full spectrum of ‘self defence’ to ‘sportive’. The material was familiar to me, but in the way a language I was once fluent in and haven’t used for many years years is familiar. My coach at Gracie Victor, John Ingallina, has been by my side pushing and pulling me along to my verification since the day I arrived at his door. From Spring 2016 he and I trained together for my BBS1 and his BBS2 exam. We trained intensively for our exams, drilling controls, submissions and counters from mount, sidemount, guard, half-guard, back mount, leg locks and standing. It is a comprehensive and intuitive syllabus though quite overwhelming at the start. It was a great pleasure to work with John on this. He’s a fantastic training partner and picks things up freakishly fast. He’s a solid grappler and while a lesser person might be threatened by a higher-ranked student, John’s been nothing but encouraging and invested in my progress. This speaks volumes. He’s a deft coach and instructor, far exceeding any experience or expertise I have in those areas. We’ve become fast and true friends; I feel really lucky to train with him and his club. In early autumn we submitted our examination materials. Proud to say we crushed our exams and sights were now locked on purple belt verification. The verification process was rigourous and fair. Once I’d passed muster with the Combatives and BBS1 exams, John arranged for a live verification exam with a Gracie Academy black belt. Frack Cucci of Linxx Martial Arts Academy in Virginia Beach made the journey to Western NY for a seminar and a verification exam. A word on Professor Cucci. He’s tremendous. 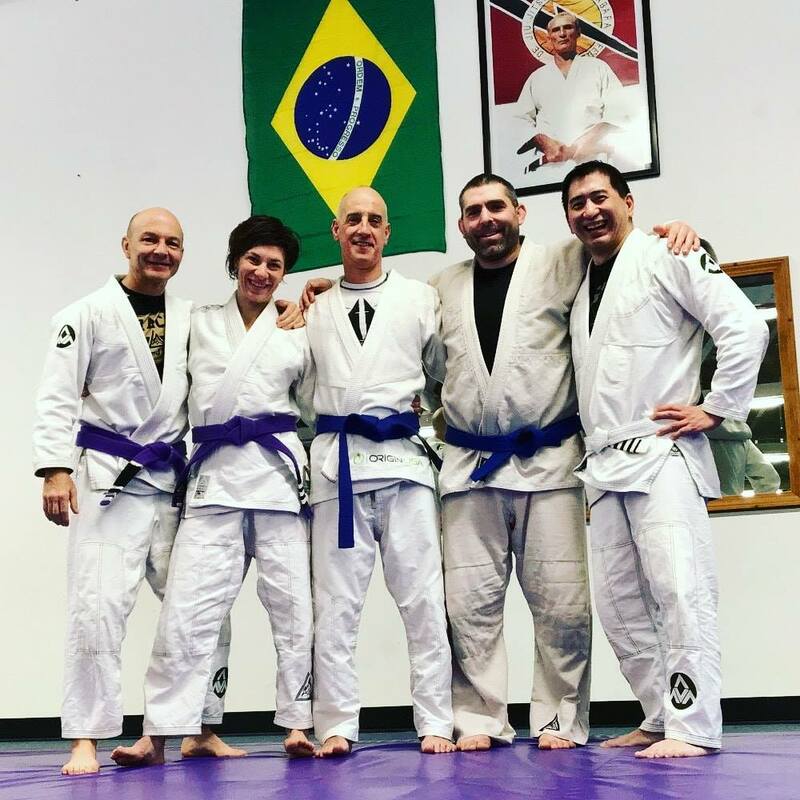 A former Navy SEAL with over 30 years of martial arts under his belt, he came to jiu jitsu – as did so many – after Royce Gracie’s performance in the early UFC. His instruction is calm and measured and the seminar – a 2 hour session on guard sweeps and a 2 hour session on guillotine mastery – was a delight. His work with military and law enforcement gives a really interesting insight. Technical tweaks for LE in light of cuffing procedures, common circumstances and unique tactical situations, as well as subduing suspects while keeping tasers and sidearms ‘out of the party’ was eye-opening. After 4 hours of a steady drill pace with my training partner, Kyle Bagshaw from Gracie Victor – if you have the opportunity I highly recommend training with him, he just reps, it’s fabulous – it was verification time. While in someways a formality – afterall the process leading up to requesting a live verification is quite thorough – the verification exam was legit. I rolled with Frank – gi, no gi and gloves-on – for over an hour. It felt relentless and put my technique, mindset and energy conservation through their paces. It was a bigger challenge than I’d expected in terms of endurance. I really appreciated being taken seriously and given a proper test. I felt valued and respected and not ‘rubberstamped’. Frank’s comments for improvement were helpful as well as hard to hear. 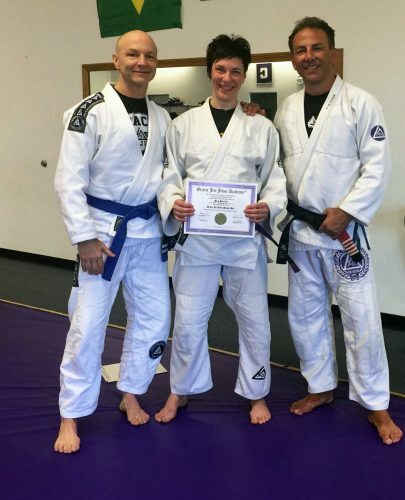 The issues that have plagued my jiu jitsu from the get-go persist. In particular, I’m far too hesitant with my offence. On the upside, the feedback was more positive than negative. I have clear areas for improvement and John and my clubmates are by my side to help me address them. 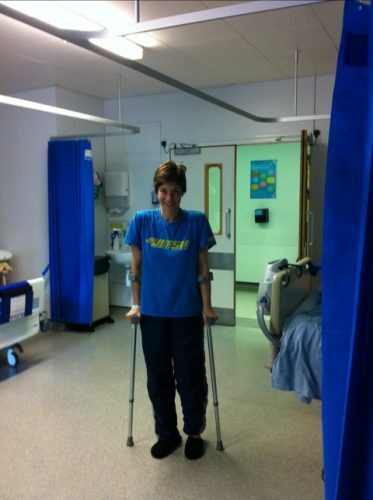 5 years ago, I was out with an ACL reconstruction. Since then, I’ve recovered from a knee op, had a baby, moved overseas and generally shaken things up. Today, I’m close to my pre-natal game. Steps forwards, backwards and forwards again. Here we are jiu jitsu, still dancing, and I am ready to work some new moves with you. Now that we’ve gotten ‘back’, let’s get ‘better’. Gentle reader, I know you go through things on and off the mats that make it seem that jiu jitsu just isn’t worth it. And perhaps, for you, it isn’t. But, if you’re here, reading this, then perhaps it is. If not yet, there will come a time when your jiu jitsu faith may be tested. Whether babies or jobs or injury, some wedge will seek to insert itself between you and jiu jitsu. But without jiu jitsu who are ‘you’? I lost my name at toddler group. From Hollie, or Hols, or Hollie McNish. I’m now known as so-and-so’s mom. However, the mom isn’t complaining about this loss of her name, as she does the same to others when she says she “got a drink with Izzy’s dad” or “ran into Molly’s gran.” Once a person becomes a parent, they are forever labeled as “mom” or “dad,” that’s just how it goes. It’s only when the stars are out and everything’s dark that my own name creeps out from under the table and I’m able to remember the person I am, with a hot cup of tea and a book in my hand and a two hour slot to remember my own plans before I turn off the light. Jiu jitsu is where I live. The ‘me’ apart from work, or family, or money, or my early 40s. It is my spirit, whimsy, vitality, grit, and madness. Without it, I’d be a husk. Jiu jitsu takes but jiu jitsu gives and gives and gives. With my verification came congratulations from friends old and new and training partners on either side of the Atlantic. While there is no me without jiu jitsu, there is no jiu jitsu without you. We are in this together and as ships on a rising tide we sail together forever part of each others’ journies. In what seem to be dark, uncertain and divided times, that’s pure and that is good. Jiu jitsu is love. ACL Operation. Photo by © Meg Smitley. 2011 Portrait. Photo by © Fighters in Focus. Used with permission. Purple Belt Verification. Photo by © Gracie Victor. Used with permission. Women’s grappling tights review of the Ranger Up Women’s USA Leggings. 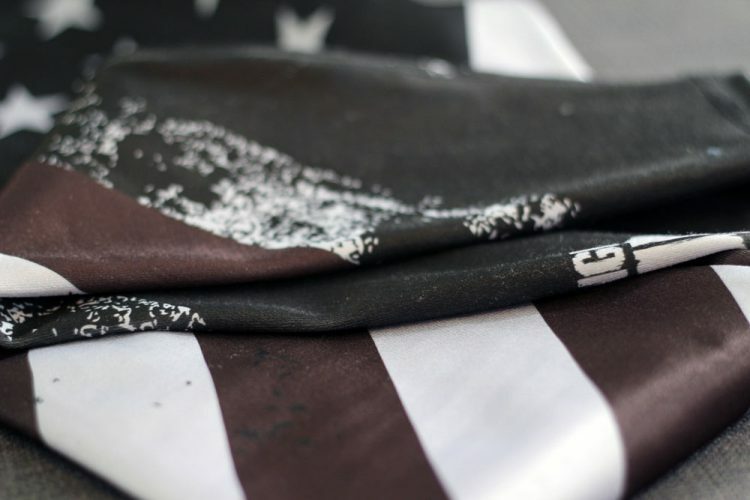 The Women’s USA Leggings are part of Ranger Up’s new premium Bombshell range for women. They are made in the USA and retail for $59.99USD. This limited edition legging sold out in 2 hours in its first run and is now on pre-order. So, if you want to get your Wonder Woman on while grappling, lifting, running, or chasing down preschoolers – stay frosty! 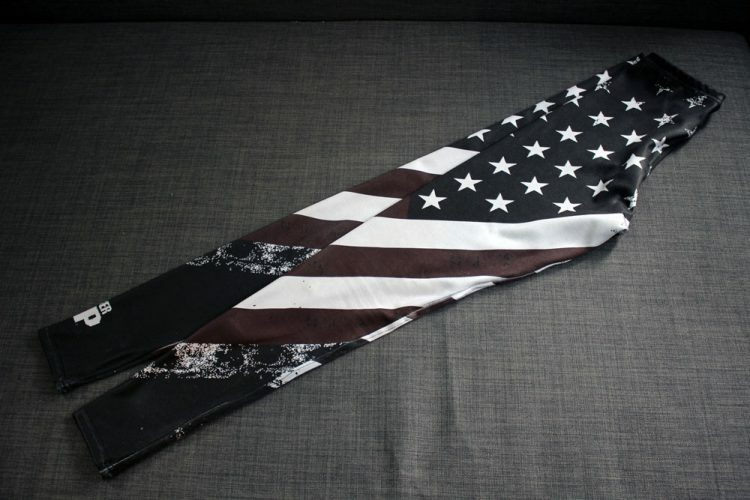 The USA Leggings offer a grunge-style stars and stripes design. The palette is nicely muted. There is very subtle red and blue-black on a black background with white stripes. The colours are blended with a paint-splatter effect. For me, this softens-up and dirties-up the look in a really appealing way. This is literally the first American flag piece of clothing I’ve ever worn. What swayed me? Full disclosure, Suzy Palmisciano, the absolute machine behind Bombshell and the USA Leggings, is a personal friend of mine. Only she could get me to put on patriotic wear, but I gotta tell you – I love the look of these things! The grunge styling gives them a tough edge. The very subtle use of colour means a design that could be naff or cheesy, ends up looking sassy not saccharine. There is also a super-heroine quality to these leggings. More Jessica Jones and less Super Girl, more badass misunderstood vigilante and less by-the-book Girl Scout. I really dig this reimagining of an American flag theme and look forward to future Bombshell designs. These are my best-fitting leggings. By best-fitting, I mean the smoothest lines at the waist and the least hiking up. The stay-put fit applies to grappling, lifting and hitting the grocery on the way home from strength & conditioning for BJJ. The USA Leggings don’t use the much-touted wide waistband. On me, I find that these lay much smoother than the leggings I’ve worn with the big band, ie Sweaty Betty, Nike, Under Armour and Athleta. The USA Leggings waistband sits firmly just above the hip bone and anchors there. It feels secure and moves only very little, even during grappling practice. Yet, it isn’t so tight that it is uncomfortable or that it pinches and bunches any softness in that area. The great fit of the USA Leggings is in part due to the secure waistband just atop the hips. I think it is also due to the great fabric. The leggings use a very thick – and silky – polyester / spandex blend. The fabric has a good level of stretch and is totally opaque. While the leggings fit like a second-skin, they are not extra tight as with compression gear. As mentioned the fabric has a lovely silky feel. The thickness of the fabric gives the leggings a premium feel and really helps with a good fit that doesn’t shift around as you do your work. The sizing runs Small, Medium, Large, Extra Large. I typically wear the size one-up from the smallest and the Medium fits me perfectly. For comparison, I wear a Small in Under Armour and Athleta leggings. I am 166CM / 5’5″ and the length of the Mediums is great for me. Pinching my knees but – tree trunks! I’ve tried to be objective and fair in this review. I honestly feel great in these leggings and love their fit. Nevertheless, it is only fair to concede my personal affection for Sooze. With that in mind I can confirm that these wash and wear very well when the care instructions are followed (cold hand wash cycle). I’ve also been impressed by how well they’ve withstood grappling training. My UA Coldgear pilled at the knees pretty much from the start, and my USA Leggings aren’t showing any signs of no-gi training abuse. I’ve also slayed in class when I’ve worn them and managed a legit armbar on Toby Reh, the Gracie Jiu Jitsu Victor blue belt, pictured above in a recreation of my glory. So, yes, I love these leggings and I’ve already pre-ordered the Valkyrie Leggings. Clearly, it is more that my friendship with Sooze that has me re-uping so fast! These leggings are a quality item, designed to turn heads and get you in the zone. I am having a great time at Gracie Jiu Jitsu Victor! We arrived in Rochester just short of a year ago. The disruption of the past year has been pretty intense. On the one hand, I miss London, the UK, our friends, family and lives there very deeply. On the other, Rochester has a lot to offer us and our family-life is certainly more balanced and happy. Big achievement! As we begin 2016, we are much more settled here. Finding the right folks to train with both at Wolf Brigade Gym and at Gracie Jiu Jitsu Victor has really helped me to reclaim the Roc as ‘my home’. There are some very skilful and welcoming BJJers in the Greater Rochester Area. For me, John Ingallina and the people at Gracie Victor offer the school that is right for me. I am incredibly grateful that this club started offering GJJ around the time that I arrived in Rochester. I am so pleased to have been welcomed and embraced by this group of practitioners. John is a very well-rounded and seasoned martial artist. This is clear from his skill and his humility. It is also clear in how invested he is in his students’ progress. John sets a great tone and his club is full of men and women of a wide range of ages and abilities. A very inclusive and loving place to train. Settling-in here has taken a toll on my health and fitness. In London, I walked many miles everyday, attended a couple PT sessions a week and trained jiu jitsu. Here, we drive everywhere, it took several tries to get my gym and jiu jitsu situation right and last year much of my ‘free time’ was eaten up with renovating our new house. 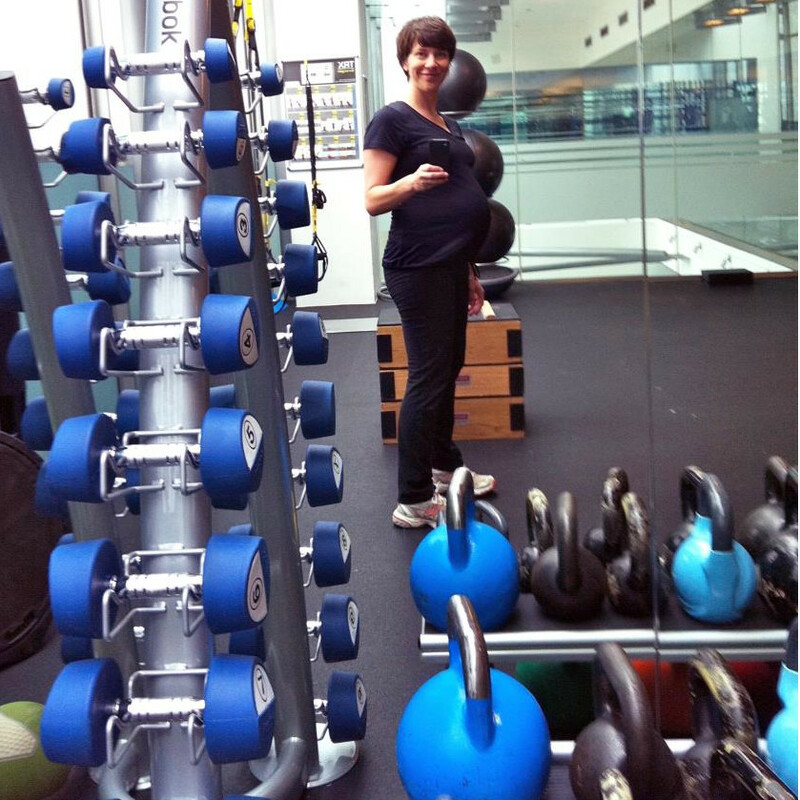 This resulted in the undoing of much of my hard work in the UK to get my fitness back after becoming a parent. When we arrived in Rochester I was 3 kilos off where I’d like to be, now I’m more like 6 kilos off. It may not sound like a big deal and in the scheme of things of course it isn’t. However, I do find it really demoralising and just don’t feel at my best, physically, while at the same time I seem to lack the lifestyle mojo I once had to eat well and to move about. As we’re getting on a more even keel now, I am hopeful that 2016 will see me lean out a bit more and get my diet to a clean and healthy state. On a more positive note, I’ve been really enjoying strength and conditioning classes at Wolf Brigade Gym and I’m there pretty consistently twice a week. I’m making a deal with myself to up that to three times a week in February. In the jiu jitsu arena, I had a chat with my coach, John, about how I’d really like to work more conscientiously towards getting my Gracie Academy blue belt and be more involved with Gracie Victor. Over the course of last year, my attendance was okay, making it in once a week as much as I could, but overseas moves are no small potatoes and there’s been a lot of work getting ourselves set-up here. This impacted on my training frequency. It also impacted on how much my head was in the game and how goal-oriented my training was (or wasn’t). John has been more than happy to meet me halfway and we’ve come up with a timeline for my blue belt examination. This has really helped me to get focused and the process of working through the BBQD (Blue Belt Qualification Drills) has been a useful exercise for me. I’ve practiced the techniques included in the Gracie Combatives programme for years. Even still, I never really internalised the names nor could I systematically name the variations for individual techniques. I could perform these techniques in class and sparring, but I was intellectually lazy about it. Having to commit the syllabus to memory has helped me to re-engage with my jiu jitsu in a number of ways. Firstly, it has helped me to consolidate and strengthen my existing knowledge of Gracie Jiu Jitsu by forcing me to properly and fully internalise a syllabus. Secondly, working through the BBQDs has encouraged me to put more mind-cycles on jiu jitsu. Since becoming a parent my visualisation and jiu jitsu daydreaming time has reduced to essentially zero; in my leisure-time laden pre-natal days I would spend several hours a day musing on technique, considering problems in sparring, writing in my training diary, watching interesting fights, reading jiu jitsu blogs. Readers know exactly what I’m referring to. After the boy came into my life and my leisure time was radically compressed, I dropped all of that ‘mental jiu jitsu time’. This affected my on-the-mat performance as well as my emotional connection to my art. Making a goal to get this blue belt thing done has helped me a great deal to build-in time for jiu jitsu contemplation. Finally, I feel much more motivated to make sure I am getting more and very consistent mat-time so I can get better at jiu jitsu and healthier in my body. Two things crucial for my sense of well-being. So, with all this talk of getting a(nother) blue belt, I suspect some readers are curious to know what is the situation regarding the belt that I wear? As some readers may remember, the jiu jitsu Internets went a bit mad when I made an off-hand remark that I would be wearing a white belt in my Combatives classes when I joined my new school. I followed this up with a discussion of why, in my case, it felt like the right thing to do, though no one at Gracie Victor expected me to change my belt. Big feelings erupted. Not so much about me, per se, but my telling of my story acted as a catalyst for a flare up of tensions around the Gracie University system, how the Gracie Academy codifies its syllabus and delivers its instruction, and the intense opinions around ‘GJJ’ and ‘BJJ’. I respect and appreciate the complicated feelings associated with ‘GJJ versus BJJ’. I myself feel uncomfortable with the somewhat divisive nature of the term ‘GJJ’. At the same time, the material that term is used for and the material disseminated through the Gracie Academy’s CTCs is exactly the sort of stuff that I want to be involved with. With that preface, what friggin belt am I wearing? This suits me very well; of course it wouldn’t be right for all readers. 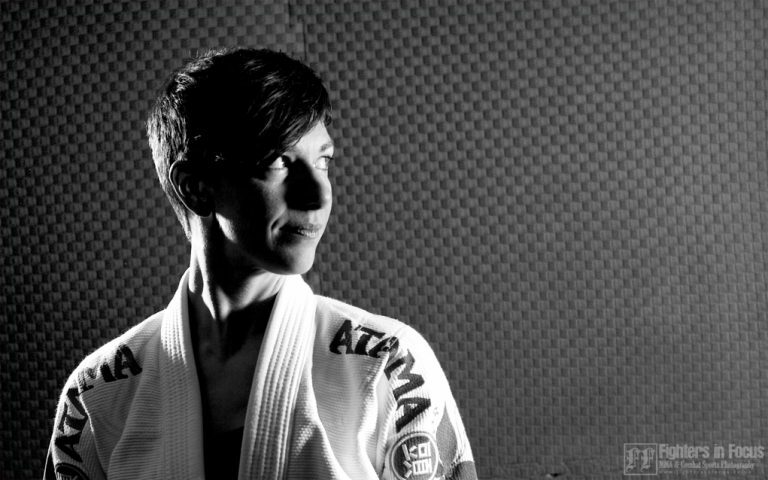 My relationship with jiu jitsu has been on the fritz for a number of years owing to a knee operation, a pregnancy, an infant, and an international move. Methodically working through the Combatives syllabus, as discussed above, has been invaluable in helping me to reinvigorate my relationship with jiu jitsu. It is my intention to work up to the Gracie Academy Blue Belt one stripe material. Then, I’d like to seek to have my purple belt ‘verified’. Could that happen in 2016, maybe yes, maybe no. Lots of smaller goals and milestones to reach first and right now I’m targeting submission of my blue belt exam materials by the end of Q1. First things first! Photos reproduced with permission of John Ingallina, Gracie Jiu Jitsu Victor.